Easily upgrade your security features by integrating our most versatile DLP – Data Loss Prevention – solution in your apps, services and platforms. 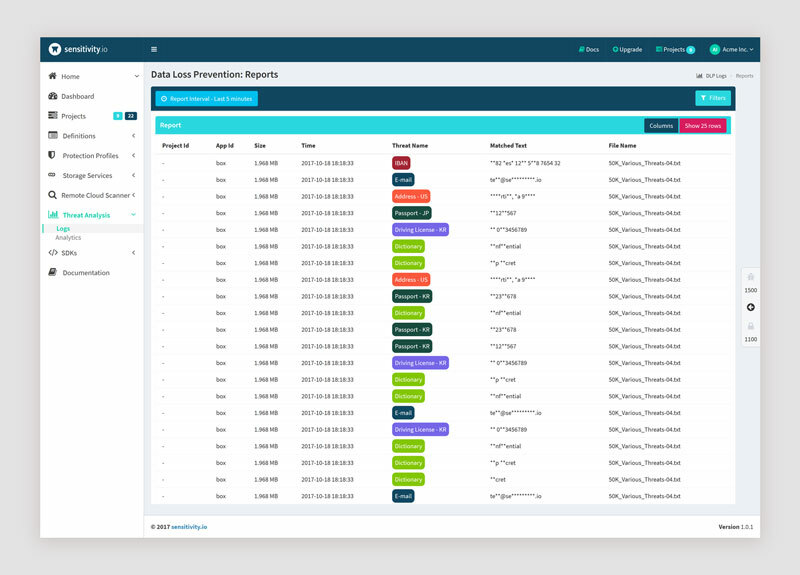 Add in-app sensitive data scanning and classification technologies to any file and string. Protect your mobile apps against data leakage and theft and stay compliant using our mobile DLP SDKs (iOS or Android) or by leveraging our cloud-based sensitivity.io DLP API. Make sure all data stored in your backup and file sharing solution is compliant with security policies and industry regulations. Scan and detect policy violations and take informed decisions. Data in e-mail, cloud file sharing, web browser, cloud services and other apps and services can be scanned to detect confidential information and further actions can be taken to prevent data breaches. Integrate DLP into workstream collaboration apps like Slack and support employees in using them with no data security compromises. Enhance data protection and increase productivity at the same time. Use powerful detection techniques as they are or customize them to your own environment, to identify and monitor data usage and movement within apps, services and platforms. The scanning engine handles large volumes of data, identifying file types, custom content, predefined content based on our comprehensive policy library and other types of data. Define what data is sensitive within your apps or services according to predefined or custom patterns, keywords, regular expressions, file types and other filters; different tags are assigned depending to type of content and relevance for business. Remediation actions include quarantine, encryption, and deletion of unauthorized or critical private or business data. Build DLP capabilities into any application, regardless if it is mobile, desktop or a cloud service. Increase productivity with messaging and collaboration tools like Slack without compromising security. Enable DLP features for end users in cloud storage, file sync and file hosting services like Dropbox. Add it at desktop application level, to the cloud app layer or both. With our SDKs, you no longer have to worry about the difficulty of adding security features to your applications or how to ensure their enterprise-readiness. We provide an innovative approach to identifying, tagging, securing or encrypting data at application level and securely handling data inside applications, regardless of their infrastructure or language. Our SDKs work fully offline, without having to stay connected to an external service or the need for constant communication with an API. In this way, data remains inside the company integrating the SDKs at all times for better overall data control and protection against data exfiltration. This feature also offers the possibility of using existing IT infrastructure for scalability. In today’s fast paced digital environment, speed is key. With our SDKs, you don’t run the risk of putting a burden on your existing processes. In fact, by adding them to the core of your apps and services, you will not hamper them or slow them down at all: scanning and classification is done at a remarkable 1 GB per minute on a single core. Our SDKs are written in C++ which ensures a smooth and seamless installation and integration on popular operating systems from Windows, macOS and several Linux distributions such as CentOS, Ubuntu, OpenSUSE etc. to Android and iOS. With sensitivity.io, your applications will possess sensitive data identification and classification features even if they are deployed cross-platform.